Oh yay! I love your announcement. Can’t wait to learn more. This sounds great and for once it has simple ingrediants my husband will eat. Trying this next week! Sounds fabulous! Its definitely easy enough to cook, while taking care of the twins! I can’t wait to try it! My blog is also dedicated to Food and Fitness. I love both equally and did not want to choose between them! I believe you CAN eat everything (in moderation, with balance – like you said) and still be healthy, fit and active. Good for you. I look forward to reading. Jen, I have not written here before but I check your blog occasionally for ideas and inspiration (the pumpkin/bourbon cheesecake was a hit at Thanksgiving!) – and you continue to amaze me!! I have slowly begun to gain an understanding of cooking and the fun that can be had in the kitchen, and your blog has been a big part of that, so thanks! I am stoked to hear that you plan to add fitness tips to this blog – it’s a passion of mine, too. I look forward to continuing to follow both your cooking AND fitness adventures! Hope y’all had a blast here in the ‘Ville on New Years and that 2010 brings our paths together soon! I just made a similar post on my blog last night too. It’ll be fun to read! I like cooking blogs that are more than just recipes! I need a healthy balance between your rocky road brownies and Gourmet mac & cheese. I want to try every recipe on the blog but don’t think that our family needs a new dessert to nibble on all week. I really should share with neighbors and friends, but once I taste all of your dishes, I have a hard time parting with the leftovers. Perhaps sharing will be added to my new year projects. I am very excited about your blog addition and am looking forward to the inspiration you will provide. This pot roast is going on the Floyd family menu next week. I have a roast in the freezer. I am wondering about the crock pot thing too. I don’t own a dutch oven… (honestly – you must have more space in your apt kitchen than we do at my house… or I have too much unused crap, i dunno). But I do have a crock pot- would the directions be the same for that? I think this would be fine in a crock pot. I would cook on low for 7-8 hours, or until tender and meat shreds easily. Lauren – you should seriously see the size of our kitchen. It’s tiny. My dutch oven stays out on the stove permanently as “decoration.” Once we get out of this apartment I am going to post photos of the kitchen. You won’t believe that I’ve been able to cook in it! It’s sad. Oh, and did I mention there’s no dishwasher! Ahh! I understand this series is about making recipes from the Gourmet website but because I’m also interested not only in great food but great fitness a lot of the meals I make come from Men’s Health recipes and short order cook because in addition to being healthy, tasty and fast they give calorie and nutritional information for balancing your protein, carb and fat intake. I thought the sauce on this pot roast was delicious and I threw in new potatoes and carrots for the last hour of cooking. My veggies were not quite done after about an hour. My roast was tender but Graham and I agreed that we liked the sauce and veggies more than the roast itself. I love the Avett Brothers! 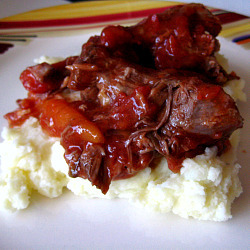 on January 26, 2010 at 11:00 pm | Reply Oven Braised Beef with Tomato Sauce & Garlic « "The way to his heart…"
I am definitely interested in trying this one. I love recipes with simple ingredients. One quick question though…it says unpeeled garlic. Was it weird after it cooked with the garlic still having its “skin” on? Did you eat the garlic, skin and all? That’s probably a dumb question, but I always peel my garlic. Smashing it is the fun part! 🙂 Thanks!